Waterfowl Guides: A Glamorous Life? Waterfowl guides log long hours to serve clients. Six years ago, Charles Snapp spent Thanksgiving morning in a duck blind with his grandson, Chase. The sky was crystal-clear, the air crisp and the birds plentiful. Teal settled into the decoys a dozen at a time, and mallards hung over the spread like kites floating in a gentle breeze. "You couldn't have asked for a better morning," recalls the longtime Arkansas duck guide. Snapp remembers that morning so vividly not because of any particular event or the numbers of birds they killed. He remembers it well because it was the last time -- and only the second time -- he hunted with his now-18-year-old grandson. As a full-time guide, Snapp can't afford to take a day off to hunt for the sheer joy of it. He has a business to run. "I have to work when it's hunting season," he said. "If I'm not working, I'm not making money. Besides, how would you like it if you paid me for a hunt and you didn't kill many that morning, but you found out my grandson and I limited out in an hour?" Columbia Basin Waterfowlers co-owner Alex Langbell says there's little downtime, even in between seasons. Similarly, Columbia Basin Waterfowlers co-owner Alex Langbell rarely hunts with his friends anymore. Like Snapp, he can't afford to pass up the chance to take paying clients during the short hunting season. "I hardly see my own family sometimes," he added. Such is the glamorous life of a waterfowl guide. On the surface, it seems like the perfect marriage of work and passion. What's not to love about getting paid to spend your days in a goose pit or a duck blind? Life is one big waterfowling party, and each morning brings new, happy faces and high spirits. The birds tumble into the decoys at first light, and the tips flow like beer at a frat party. But some days, the clients are grumpy and the birds just don't fly. And those juicy tips? They sometimes won't top off a gas tank. "Everyone sees the hunting part of it, but most of my clients don't realize what goes into the business behind the scenes," Snapp said. "People think I get to hunt all the time, also. That's hardly the case. I only carry a gun to chase down cripples. Jackie (his wife) and I spend just about every Thanksgiving, Christmas and New Year's Day out scouting in preparation for the next group of hunters. We haven't had a normal family winter holiday in years." Even when the hunt finishes early, there's still more work to be done, such as scouting ducks and geese truckside. That's not to say they don't love what they do. Of course they love it. However, both men insist running a waterfowl guide business is just that -- a business. There are bills to pay, equipment to fix and phone calls to return. There are good days and bad days, clients who are never satisfied and those who seem like long-lost friends, hunters who understand that no one, not even the greatest guide in the world, can produce a limit every day. Both guides say the good clients far outweigh those they hope never to see again, but they agree many of their shooters don't understand that success is often out of their hands. "I can't control the weather, and weather is usually what matters most to our success," Langbell said. Most customers, however, understand that hunting is just that, and no one can bring birds in to the decoys when they just aren't flying. Langbell hates those days as much as his clients do. "The worst part is knowing it's going to be a tough day. I think that's what separates good guides from the bad ones," he said. "The good ones can make any day fun, even if the birds aren't flying." A good guide knows how to put clients on the birds and must have the means to get them there. Guide Charles Snapp, now retired, has endured broken bones and knocked-out teeth during his guide career. Snapp has broken his back, busted his arm and knocked-out teeth in the name of killing ducks. On one searing-hot day in September 2009, he chainsawed through a tangle of logs and limbs, the byproduct of an ice storm that had downed trees and power lines throughout northeast Arkansas. The veteran guide was attempting to open up a path to a swinging bridge he built several years ago leading to a boat that takes hunters to a hole in green timber. Without a clear route to the boat, he couldn't get clients to the birds. "Then I'll have to cut new boat trails to the holes in the timber, so that may take me another week," he said. Snapp jokes that as soon as one season ends, another begins. He might take a day or two off after the hunting season closes, but long before the birds start filtering back north, he's out in the field pulling decoys, removing synthetic blind material and making vital repairs to the countless pieces of equipment he uses. He's also sprucing up the lodge and developing his schedule for the next season. As spring evolves into summer, Langbell works on landowner relations, securing new properties, checking on the status of current leases and planning out pit blinds based on crop rotations. In fall, he again meets with farmers to determine pit blind locations. Then, he digs and builds pit blinds -- making final adjustments right up until the season begins. "There's always something to do," Snapp said. "I don't think people realize how much work goes on to make sure everything is perfect and ready to go when the clients arrive." Waterfowl guides must know how to read the birds and bring them in. Once the season starts, the work really begins. Although Snapp usually finishes up his hunts around noon, Langbell and Rhode Island sea duck and diver guide Brian Rhodes will stay out all day if they have to. They don't mind, but a full day in the blind can lead to a long night at home. Langbell often doesn't see his children for days on end, and when he does, it is sometimes only for a brief few moments. He is on the phone for an hour or two when he finishes hunting and scouting, or he is in his garage cleaning and repairing gear and getting ready for the next hunt. He loads his trailer and truck and turns in at 10 or 11 p.m., only to rise at 4 a.m. to do it all over again. Snapp and Rhodes are often up at 3 a.m. It's a grueling schedule. Even if they finish early, neither Langbell nor Snapp heads home for a few hours on the couch. Both grab a quick bite and then hit the road to scout for the next hunt. Langbell said he spends as much time watching ducks and geese from his truck as he does from a blind. He has to. His business depends on satisfied clients, so if he doesn't have a handle on the geese, they don't kill birds. "I'll go get a cup of coffee and drive around and watch birds. That's a big part of it," he said. "I know that sounds easy and fun, but it can be pretty tough, especially if you aren't seeing what you hope to see." But for every rough day, Langbell has had countless memorable hunts, days that make the long hours and cold, wet days worth every shiver. His favorites moments are those when he helps new or young hunters get their first birds. "It's really awesome knowing that I'm in a picture with them in their photo album or their wall with their first goose," he said. "I love it when guys are really into the whole experience. I want them to have the time of their life." That's exactly why Rhodes loves the job so much. He hunts eiders, scoters and oldsquaws -- ducks many waterfowlers don't otherwise get to see, so the clients appreciate the entire experience far more than they might if they were chasing mallards over a flooded rice field. Rhodes feeds off their enthusiasm, which makes the effort worth the hardships. For Snapp, the most rewarding part of being a guide is connected to the people he hunts with. He has spent time in a blind with professional athletes, politicians, singers, race car drivers and other famous people, but he doesn't see them as celebrities, only as duck hunters. Still, he admits to getting a thrill out of meeting high-profile people. The weather is often a primary factor that determines whether a guided hunt will be successful or not -- although clients might not always be sympathetic when conditions foil a hunt. Surrounded by waterfowlers, birds and nature, guides are driven by passion, not money. Famous or not, they all pay the same rate. Snapp hosts upward of 1,000 guided and unguided hunters through his camp each season, but even he says it is virtually impossible to make a good living just on guiding alone. His wife, Jackie, helps run the business, and the couple owns rental properties and self-storage units that provide additional income. "A lot of people think guides make a lot of money based on the rates we charge, but I promise you guiding has a very low profit margin," Snapp said. "If that ice storm hit a few weeks earlier and we had to cancel a week or two of hunts, I don't know where we would have been." So where does all the income go? Leasing high-quality ground is undoubtedly the biggest expense, but it's mandatory. Last summer, Langbell was working on securing a large farm in southeastern Washington with good goose hunting potential. The price? $8,000. All told, he figures his business costs $20,000 or more to run each year. Snapp leases 6,000 acres and spends thousands each year on gas, electricity, phones, advertising and other incidental expenses. He also has to pay his guides. Fortunately, Langbell doesn't have to rely on ducks and geese to pay all his bills. Neither does Rhodes. He drives trucks in the off-season, while Langbell is a professional firefighter, a job that gives him a steady source of income and full benefits. "It would be really tough to make it just on money from guiding because the season is so short. I would have to pay for my own health insurance, and there wouldn't be any other benefits," he said. "I don't think a lot of guys who want to go into guiding realize that." Even guides who don't have to pay for access have to spend big money just to get started. Rhodes doesn't lease any land, but he spent around $20,000 before he took his first paying client five years ago. He was required to get his captain's license, needed a boat big enough and safe enough to carry clients and gear, and had to buy liability insurance. And like any other business owner, he had to spend money on advertising to get customers. All three men were waterfowl fanatics before they turned their passion into a business. Snapp's father ran a motel (which became the base of operations for his guide service), and he started taking motel guests when he was just a teenager. "I'd come back from hunting with a bunch of ducks, and all these guys would ask me to take them, so I started taking them for a few dollars a day," he recalls. "That made a lightbulb go off in my head." Langbell met Craig Richie and Steve Schultz, owners of Columbia Basin Waterfowlers, who recognized his drive and talent and offered him a share of the business eight years ago. He gladly accepted and is now co-owner with Richie. Langbell credits his current status to networking and simply being in the right place at the right time. "I got tired of telling people 'no,'" he laughs. "It just seemed like the thing to do and so far, it's worked out pretty good." Even with the limited income and lack of free time, there's no doubt all three men love their jobs. Why wouldn't they? Not only do they get to spend their seasons in the field, but they also hang out with a bunch of great guys who love waterfowling as much as they do. As an Avery pro-staffer, Langbell gets invites to hunt all over North America with fellow Avery pro-staff members, and he's managed to hunt in a variety of places for all kinds of ducks and geese. His job as a guide has also led to a new venture: He's working as the producer for the television show "A Fowl Life with Chad Belding," which airs on The Sportsman Channel. Rhodes travels to Alaska each fall to help guide for four weeks before the Rhode Island season opens, an opportunity that came from his own guide business. Snapp has made friends all over the country, and occasionally travels to Canada to hunt before his own season opens. He's been on television countless times, and he gives seminars at consumer shows when his schedule allows it. "I've been doing this for 30 years now, and I couldn't think of anything else I'd rather do," Snapp said. "There have been good years and not-so-good years, and it's a tough way to make an honest living, but would I do it all over again? You better believe it." Editor's Note: This article was written in 2009. Since then, Charles Snapp has retired as a guide. 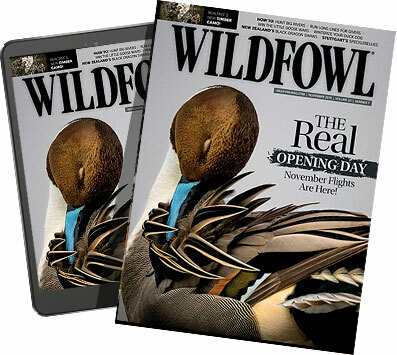 Wildfowl magazine wishes him all of the best.